Cheli & Lyn were wed at one of our favorite Premium Locations, a suite at the Hay Adams Hotel overlooking the White House. After sharing a beautiful, intimate ceremony with Rev. Laura, they enjoyed champagne and treats – we caught up with them to share about their experience! Tell us a little about yourselves! We are from Atlanta, but we moved to St Petersburg, FL to live “The Salt Life” in early 2016. We knew each other socially for more than 6 years before we connected on a different level 🙂 during a sailing vacation in the British Virgin Islands. We are still sailing and have a golden retriever and an orange kitty. We have been together for 16 years as of December 2016 and are still going strong! Why did you decide to elope, rather than do a “big wedding” or get married at the courthouse? We always intended to have a big celebration separately in our home town with family, long-time friends and our community (and we did have this celebration in Atlanta, after our elopement.) However, we wanted our ceremony, and our commitment to each other, to be only about the experience and words we were sharing; we did not want anything to distract our focus from the intensity of the moment and lifetime memory. What drew you to get married in Washington, DC? 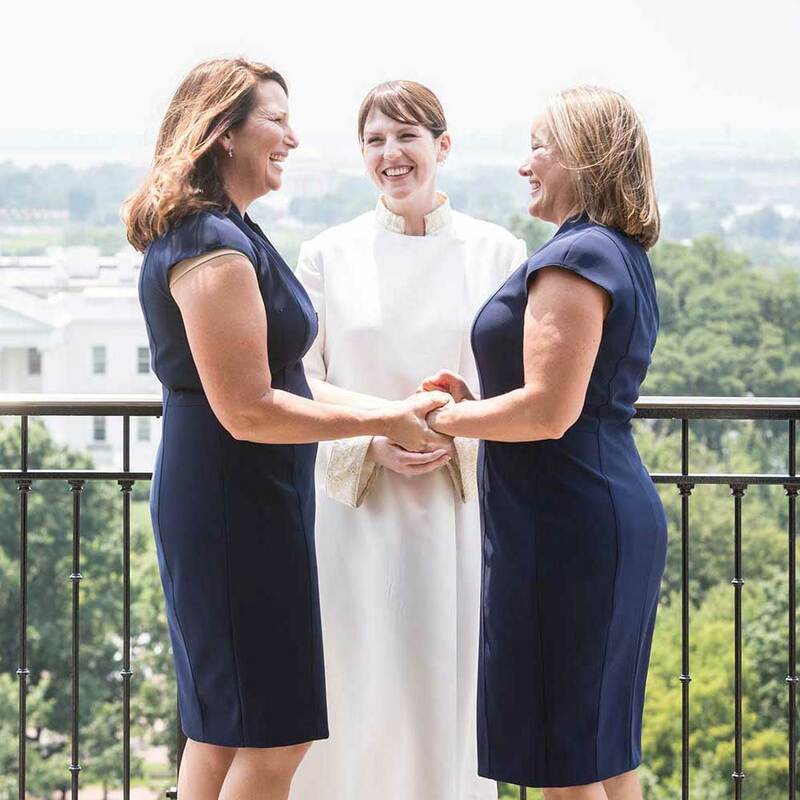 The symbolism of getting married in our nation’s capital was significant in our decision. We believe in marriage equality and felt like it had a chance to be more protected in DC, if ever at risk again. Additionally, we were excited to choose the historic Hay-Adams Hotel for our wedding and appreciate their support of our community over the years. What did you like about working with DC Elopements? For two busy professionals, having a “one stop shop” was incredibly valuable. Laura and her team helped us with hotel package pricing, make-up artist, hair stylist and professional photographer, not to mention the marriage licenses, legal paperwork, etc. From the moment we said “go”, she had everything under control and handled until after we said “I do.” It was exactly what we hoped for and more. Also, we know Laura is frequently booked solid and we are honored we were lucky to have her preside over our ceremony and special day. What are your favorite memories from your wedding day? Both: Waking up in a gorgeous suite overlooking The White House, the fun we had with all of the stylists getting ready while listening to classic R&B, eating delicious snacks and drinking champagne, and hearing the comment “this is the least stressful wedding I have ever been a part of.” A sunset convertible limo ride around the monuments and other sites like the Supreme Court, which had just affirmed marriage equality for the entire nation a few days before our wedding. Lyn: Seeing my soon-to-be-wife cry during the ceremony and whisper “this is real! And it’s really happening” as Rev. Laura began. Cheli: All of the above, plus the “big reveal” when Lyn revealed that she had my name professionally painted on her toenails during her prenuptial pedicure – one letter per toe!